Haz clik aquí para leer esa carta en español. It's fishing season in our part of Mexico, and once again I'm reminded of the story of the calling of some of Jesus' disciples, who just happened to be fishermen. I'm specifically struck by the fact that all four of them left their nets immediately. 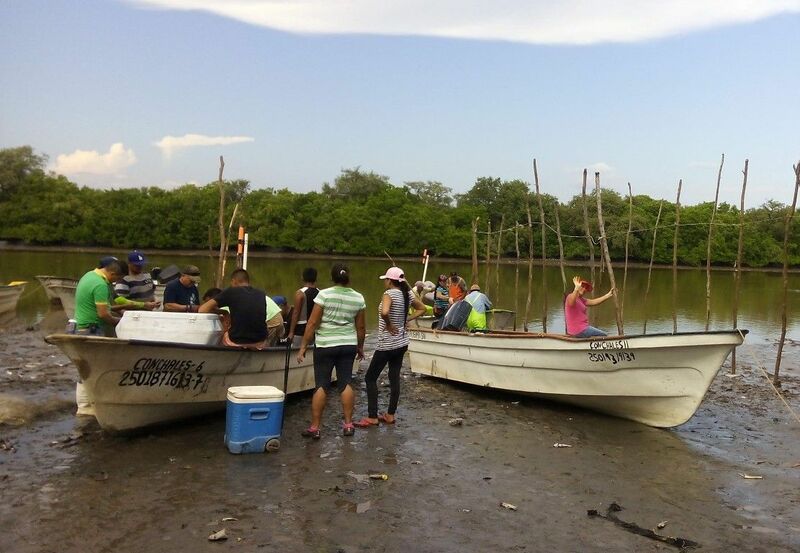 Fishing in Boca del Rio isn't just a job, it's a way of life. Generations of men have fished this river and these ocean currents for decades and Lord willing they will be able to do so for decades to come. 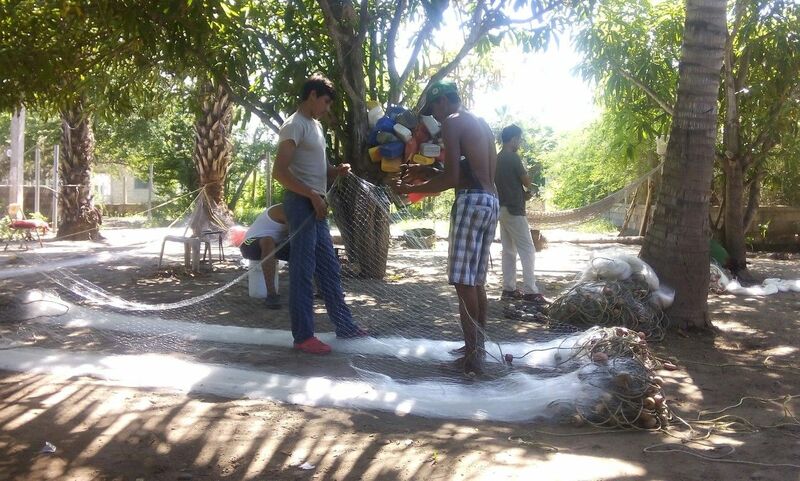 In the photo above, Daniel is mending his nets while his two sons help. This is the family business. It's what these men know, and I'd imagine that it was the same in Jesus' day. Jesus' simple invitation to "Follow me!" was compelling enough that it caused these two sets of brothers to drop everything they knew and obey. We're seeing that kind of faith lived out here in Las Glorias and Boca del Rio in the lives of young men like Fernando, one of Daniel's sons. Fernando will be traveling with us at the end of this month to Central Mexico on his first-ever mission trip. Pray for our team as we take Bible training and parenting classes to the states of Nayarit, Guanajuato and Puebla. 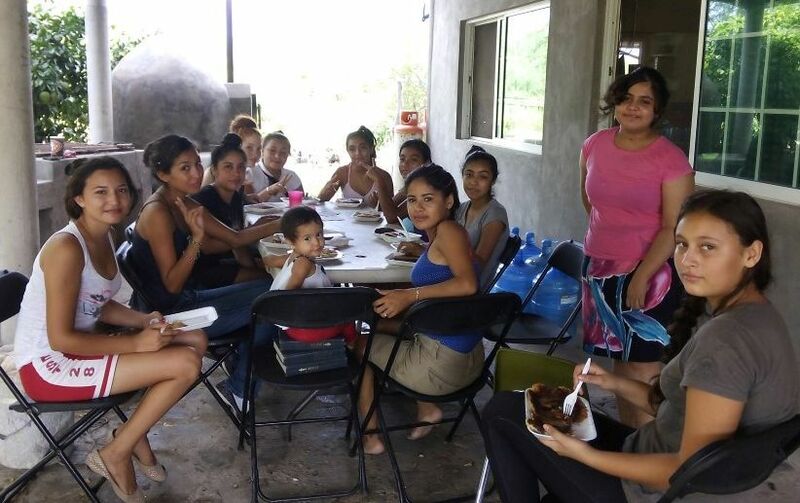 For the past few months, our small fellowship in Las Glorias has been raising funds for a young lady in our village. You have probably already seen the name "Danira Rocio" in previous letters. Rocio is a 17 year-old girl who desperately needs an operation to insert a titanium plate into her skull. Two years ago, she received a blow to the head and by the time doctors saw her, an infection had begun. In the end, the doctors removed a section of her skull. When they sent her home in May of 2014, they didn't give her much chance to live, let alone walk. But Rocio is a fighter and she firmly believes that God has called her to preach Christ. That's why she believes that God allowed her to live. Today she walks, slowly and with a cane, but she walks, praise God! Doug had the opportunity to baptize her in April of last year and we're amazed at what God has done and is doing in her life. We can't wait to see what He has in store for her future. Please pray for this Godly young lady! Our local community has raised about $1000 of the $5000 necessary to buy the plate. In June of this year, doctors from Los Mochis offered to perform the surgery free, if she was able to supply the plate. So, that is our goal! If you would like to get involved in Rocio's cause and help us purchase the materials necessary for her operation, please let us know. We have set up a "Go Fund Me" account, which you can access by clicking here, or you can make a tax-deductible donation through our sending church in Oregon. Donations must be made out to "New Hope Church" with "Mexico Mission-Rocio" in the memo line. Note that donations given through "Go Fund Me" are NOT tax deductible. This is a photo of our girls' group during a farewell party for Keala, who was instrumental in getting this group started. Rocio is the young lady standing on the right. This week, we have a letter to share with you from Pastor Braulio, who pastors a small congregation in Las Flores de las Culebras. Be sure to read the "Prayers and Praises" at the bottom of this letter! Blessings, Brothers and Sisters in Christ! We give thanks to God for each day that He has given to us. My family and I are very blessed by the help and support that God has sent to us through our brothers and sisters in the faith. 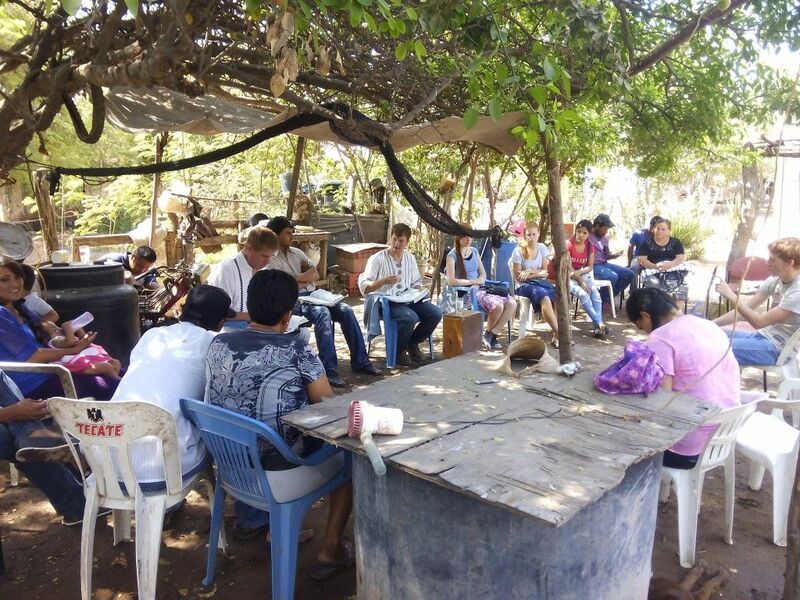 Your prayers have been a very important factor in our ability to continue forward in the pastoral ministry in the village of Las Flores, which at certain moments has been difficult. We have seen great miracles on the part of our God, which have strengthened us to continue forward. The family of Brother Cristino is quite joyful due to a miracle which he received from God. His legs were cured of a bacteria which was eating his flesh and there was much fear that he would lose his legs. The family has decided to host Bible studies at their home every Wednesday and Sunday. They are shining as true children of God. Glory to our Lord Jesus Christ!!! We continue to visit the families of Sister Inez, Sister Hermeregilda and Brother Melecio in their homes, since it has become difficult because of their infirmities for them to attend church services. We ask for your prayers for each of these elderly believers. Las Wednesday, a new family came to our study: Rosario and her daughter Nataly. They have a great need in their hearts. Pray for them, please! Two of the local fishing boats moored to unload their catch. The woman in pink who is waving is Beatriz, Fernando's mom. The soccer tournaments for children, adolescents and youth have been suspended for the rainy season. We'll be restarting them as soon as possible. Keep praying for the villages of Las Culebras and Las Cañadas. Because of the soccer outreaches in those villages, many doors have been opened to meeting new families. Pray for our family as well: Braulio and Pily, and our kids Madai, Nehemias and Eunice. Please pray for fishing season which has just begun. Pray for Rocio as we continue to raise funds for her operation. Pray for our mission trip to Central Mexico where we will be training and encouraging churches during the month of November. Pray for Keala as she has finished her one-year internship with us and has returned to life in Michigan. Pray that God would continue to grow and direct her every day!!! Praise God -- We have received our 3-year temporary residency and the accompanying car permit!!! Pray for Ricardo and the Ramirez family who are going through some difficult times right now. We'll be sending an update from them next week. Pray for the new church gathering in La Pitahaya. Julio and Lupita are very excited that we are finally able to begin meeting in their home. Jeremias will be helping to lead this weekly study. Praise God for the young ladies who are attending the weekly girls' group at our house. Pray that God would grow them into godly young ladies and that they would seek Him in all they do. Praise God for all of our brothers and sisters in Christ across the U.S. and around the world who continue to pray for and support our ministry. Thank you, everyone!! Keep praying for all of the various ministries with which we are involved and for all the pastors and missionaries in our fellowship: Jeremias, Jessee, Braulio and Pily, Joaquin and Luz, Ricardo and Cristina, Narciso and Maria, & Fabian and Sarah.